By Nancy Bradish Myers, Catalyst Healthcare Consulting, Inc. I am not an expert on immigration or building walls. I don’t pretend that I can totally understand the political strategy of either party at the high level of the government shutdown. But as someone very familiar with the FDA, I am growing increasingly concerned that the longer the government shutdown continues — dragging the FDA along with it — the greater the potential for harm to the public health. To a certain extent, I think we, the public, have become somewhat numb to the implications of government shutdowns — especially one that happens over the holidays, as it did in this case, or when, as with some past shutdowns, they have been short-lived, without much of a visible, long-term impact. However, this shutdown feels very different to me. There is a partisan intransigence that is unusual, even for Washington. The political rhetoric is escalating as the days tick by and as both sides play to their political bases — setting the stage for the 2020 elections. It is hard to identify the turning point event that will bring them to a compromise. To date, the public has not engaged enough to persuade either side to blink in this staring contest. Early in a shutdown, it is hard to tease out the true impact on affected agencies like the FDA. However, thus far, FDA Commissioner Scott Gottlieb has done a remarkable job harnessing Twitter and educating both internal FDA staff and external stakeholders about what is and is not happening at the agency during the shutdown. He is walking a fine line; he must identify which tasks the FDA cannot perform, in order to set expectations with regulated industry and others. At the same time, as a member of the administration leadership team, he is trying to be reassuring that some at the agency are manning their posts, guarding the public health. His actions and language must be seen as loyally supporting the administration’s messaging, perhaps downplaying the impact withholding appropriations is having on the FDA and its staff. The FDA cannot accept any new drug, biologic, device, or generic applications that require payment of user fees until the shutdown ends. The FDA is also not accepting any new INDs for review (aside from emergency INDs). 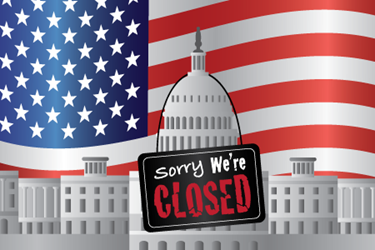 If 40 percent of the employees are furloughed, that means that much of the work that supports the agency’s public health mission is being delayed or halted in its tracks. Carryover funding that is being used to support certain interactions and “discussions” with companies to help advance development programs could run out in various centers within weeks. And it’s noteworthy that even with that carryover funding, user fees are additive to appropriations and are dedicated to certain well-defined activities; funding from user fees and appropriations cannot be used interchangeably. Therefore, while carryover funding is indeed helpful for certain key FDA responsibilities to continue for the time being, they will not replace what’s missing in other areas. Many of the hiring efforts the agency has worked on so diligently over the last year are being held up, making these critical government jobs less desirable. And this is what is happening as there are still leftover user fees from 2018 to keep the ship afloat. But what happens with that funding and excess appropriations from 2018 are used up? What’s interesting to me is that few of the key FDA stakeholders who are closely tied into the agency seem to be sounding any alarm bells at a level that I would have expected. Things are still remarkably quiet. Perhaps this is due to the fact that the shutdown aligned with the holidays and end-of-year vacations. Maybe it’s because the FDA itself is not sounding the alarm urgently. Perhaps people are resigned to the fact that higher-level politics are playing out, and some groups may not want to get caught up in a vitriolic political fight, or maybe they don’t feel their voice will be heard. Some may reflect on past shutdowns and note they were generally short and employees were eventually compensated for the time missed, so another shutdown should not be considered a “big deal.” Maybe it’s because roughly 60 percent of FDA staff are still working. All in all, there are likely a number of reasons for limited advocacy. The regulated industries that deeply value cutting review times — even if it is by weeks or a few months — have been surprisingly quiet. This may reflect the fact that CDER, for example, has approximately a month’s cushion of FY18 user fee carryover that is keeping user fee-supported staff working. But this relative quiet could end soon; if the shutdown continues through the end of this month, Gottlieb has indicated that this carryover funding will run out. “Among our medical product user fee programs, the one that will run out of carryover balance first is likely PDUFA, which funds new drug review.” As of Jan. 5, “we have about one month of funding left,” he said. Thus, the shutdown may now begin to affect the work most critical to industry: pre-market product review. Depending on the duration of the shutdown, this could lead some current FDA staff to consider jumping ship to seemingly more stable, predictable employers (adding to the FDA’s already-difficult task of competing with industry for employees). The FDA’s ability to recruit and retain new staff would be affected as well. Then, even when the funding spigot is turned back on, we may see ripple effects throughout the year, which could come in the form of missed deadlines, postponed initiatives, and delayed conversations that help advance new science. This week, House Democrats indicated they will start trying to move individual agency appropriations forward on a piecemeal basis, and the Agricultural/FDA Appropriations bill appears set for a vote in the House this week. However, President Trump has said he’ll veto any such bills, absent a compromise, and Senate Majority Leader Mitch McConnell (R-KY) does not plan to consider any of them unless Trump plans to sign them. So, now that we are on track to experience the longest running government shutdown in U.S. history (as of tomorrow), and if you agree the lack of funding is increasingly impacting important public health agencies like the FDA, I would humbly encourage you to engage. We all rely on the FDA for safe medical, food, cosmetic, and animal products and for regulating tobacco. We just need a catalyst to make those in charge realize they need to overcome the stalemate rather than dig in their heels. So, I will start. Congress and President Trump, please get over the wall and fund the FDA now! Congressional Research Service report, Federal Funding Gaps: A Brief Overview, September 2017, as reported by MarketWatch, Jan. 9, 2019. Nancy Bradish Myers, JD, president of Catalyst Healthcare Consulting, Inc., is a Washington, D.C.-based attorney with deep expertise in healthcare law and regulation, policy development, patient engagement, and government relations. She served as senior policy counsel in the Office of the FDA Commissioner, as well as special assistant/senior strategic advisor to the FDA acting deputy commissioner for operations. Myers has been closely involved in drug, biotechnology, and medtech regulatory issues for over 25 years. She currently advises clients on regulatory and health policy matters. You can reach her at nancy@catalysthcc.com or connect with her on LinkedIn.